3 Most Important Things to Know About Aromatherapy! Aromatherapy means to treat with aroma through inhalation and is a natural holistic healing therapy. The true practice of aromatherapy is a wedding of both science and art in the use of pure plant essential oils to enhance your physical, mental, emotional and spiritual well-being and health. Research shows that direct inhalation of a pure essential oil will remain longer in your cell tissues (4-6 hours) than by any other method of application. WHAT ARE Essential Oils? Essential oils are the subtle, aromatic, and volatile liquids extracted through distillation from a single botanical source (flowers, seeds, leaves, stems, bark, and roots of herbs, bushes, shrubs and trees), the part of the plant yielding the maximum amount of essential oil. Essential oils represent the soul essence of a plant and carry its life force energy matrix. As such essential oils are highly concentrated, a drop or two can produce significant results. These precious plant distillates are the active nutrient resources within a plant and act like blood to nourish and protect the plant from bacterial and viral infections, cleansing breaks in its tissue and delivering oxygen and nutrients to its cells. HOW AROMATHERAPY WORKS! It is well known that aroma reaches and influences the deepest most primitive human instincts and emotions. Your logical brain is not involved in your process of smell. You actually feel aromatic scents. Unlike your other four senses (taste, touch, sight and sound) your brain does not filter or interpret scent. 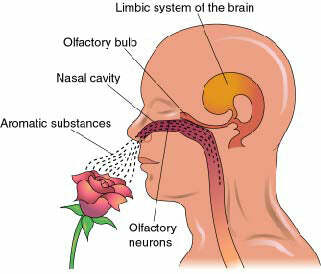 Rather scent has an immediate affect via your olfactory nerve upon your brain's neuro-receptors.